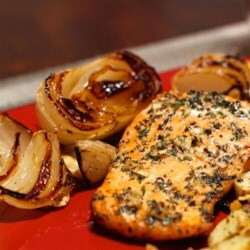 "I love Roasted Onions - no peeling, and the cut surfaces turn rich caramel brown." Cut onions in half; toss with oil and a generous sprinkle of salt and pepper. Place, cut-side down, on a lipped cookie sheet.